So begins six months of abject misery, tears, and frustration—that just might turn out to be the best thing that ever happened to them - in another laugh-out-loud look at the way we live now from bestselling author Nick Spalding. ©2014 Nick Spalding (P)2014 Brilliance Audio, all rights reserved. SO funny!!!! This book was absolutely hilarious. It's one of my favorite books so far this year. I love the writing style, and the voices for both Zoe and Greg were perfect. At first I loved Zoe's part, but then after a few rounds of Greg, I decided his was funnier. There were times where I was doubled over in laughter, tears streaming down my face. The story was witty, sarcastic, poignant and had an overall terrific message. I totally recommend, especially if you like books that make you laugh out loud. If you have ever wanted to lose weight, ever been on a diet or tried exercise to lose weight- and you have a sense of humor - listen to this book! Fat Chance follows a married couple, Zoe and Greg, through a Biggest Loser type radio show. Written in journal style with both parties describing their experiences. Painfully honest at times, but so flipping hilarious that you can't help but laugh out loud. Narration was excellent from both Heather Wilds and Napoleon Ryan, I would be hard pressed to chose a favorite. This book also inspired me to get back out there and start exercising again, so it was definitely a win win picking this jem up while it was on sale. Laughed out loud thru the entire book. Extremely entertaining, narrator does an excellent job. Made me laugh purplish on many occasions. Reminded me of Bridget Jones Diary. A story that got me to really think about how nice it would be to make the effort and not give up. Going to use this as the impetus to sticking with proper diet and exercise. A very good story too. The story had me commiserating with on all their weight loss adventurous and rolling with laughter nearly through the whole thing!The narrators were perfection! Great book with an opening hour that is "MUST LISTEN"
HYSTERICAL start that falls into a story that is not nearly so funny anymore but is still sweet to listen to through the end. I still recommend it, but that change in content was definitely disappointing. Will for sure check out other books by this author. Lotsa Laughs--a Really Fun Listen! The two events that led to Zoe and Greg agreeing to sign up for a radio station weight loss contest are absolutely hilarious. These events, one for Zoe, one for Greg, are so memorable I could see myself re-listening to the book just to hear them again. Along with a bunch of other funny parts, this book is also serious and even a bit educational about losing weight. But you won't be listening to Fat Chance to be educated. You will be listening because you need some laughs right now, you've wondered about the people who participate in these strange shows, you are wishing you could do something about your weight, or your curiosity got the better of you, like mine did. It is an easy and quick listen with good narrators. I particularly liked Napoleon Ryan. He seemed much more at ease doing comedy and was perfect for the part of Greg Milton. You're got nothing to lose ( or maybe you do? ), so give it a try. It's FUN! You will be forgiven if you feel like you want to give up on Fat Chance somewhere during the first two chapters. Nick Spalding walks a fine line, trying to capture the pain of being obese while still trying to be funny. Rather, he doesn't walk such a fine line. There are numerous times during those two chapters where he strays uncomfortably off the line. Far enough that I was thinking of shutting it down. But stick with it. I'm glad I did. The problem is in the trying to be funny part, not in disrespect for his characters. Spalding's sympathies lie squarely with his larger in life protagonists, a married couple who reluctantly enter a weight loss contest. They learn a lot about themselves in the process as they attempt exercise plans, try out various fad diets and weight loss gadgets, and are forced to parade the whole shebang in front of a rapt radio audience. As their life improves over the course of the contest, their health (mental as well as physical) inevitable improving as they get back in shape, the comic vignettes become more palatable (cf. Greg's caffeine jag) even if they are still sometimes too sadistic (cf. the consequences of buying cheap sneakers). The messages are positive and the events are humorous enough. The ending is telegraphed, but I give Spalding credit for only suggesting rather than explicitly stating it. The narrators go a long way toward keeping you listening when you start to think about bailing. They are both fabulous as the married couple, alternating chapters written in the first person of each character. I'm sure you will instantly envision the English actors who would play them as you listen to their voices. "Fat Chance" restored my belief in reading (listening) fun. This novel had me laughing out loud repeatedly as the author explores weight loss gimmicks and bizarre exercise programs combined with an inside look at a marriage, a work-world, family relationships and more. 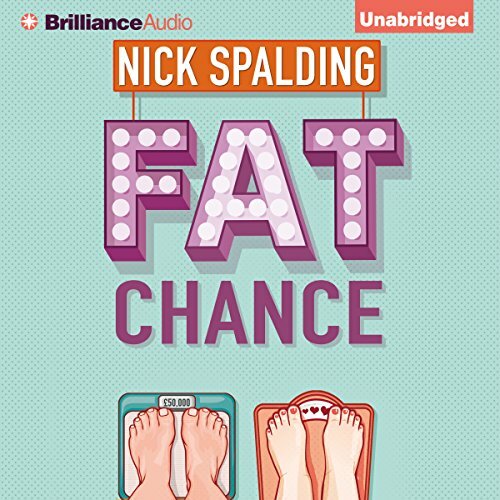 Nick Spalding delivers a story about a married couple who have decided that their weight gain has gotten out-of-hand. When the wife, Zoe, is offered a spot on a radio show that promises a large reward for the greatest weight loss, she gets her husband on-board and signs up. The story then proceeds to outline the most hilarious journey through the weight loss world that I could imagine. Most of the strange diets and exercise programs the couple tries are fads and programs that I have come across in one way or another. OMG. Hilarious. The narrators are flawless - perfect. I won't say that this couple are 100% credible but close enough to make the story a real treat. I highly recommend this fun and uplifting joyride. If you need a laugh, take a ride right here. I really enjoyed this read: light, quick, funny as all get out in places (I got tears in my eyes laughing when Zoe is trying on the green dress...) but based in a shared reality that anyone who has ever dieted will instantly recognize. I'll check out more from Nick Spalding! I believe I'm a fan now.